North Korea says it “successfully” test-fired a ballistic missile on Sunday in a launch supervised by leader Kim Jong-un. State news agency KCNA described the device, fired into the Sea of Japan, as a “surface-to-surface medium-to-long-range ballistic missile”. 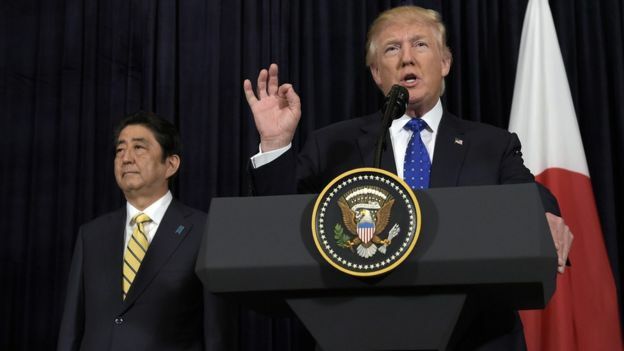 South Korea’s defence ministry called it an armed provocation to test the response of US President Donald Trump. North Korea’s latest ballistic missile test has been widely condemned. China said it opposed North Korean missile tests and Russia said it was concerned, calling on all parties to prevent any escalation in tensions. KCNA said the missile, named the Pukguksong-2, was a “new type strategic weapon system”. 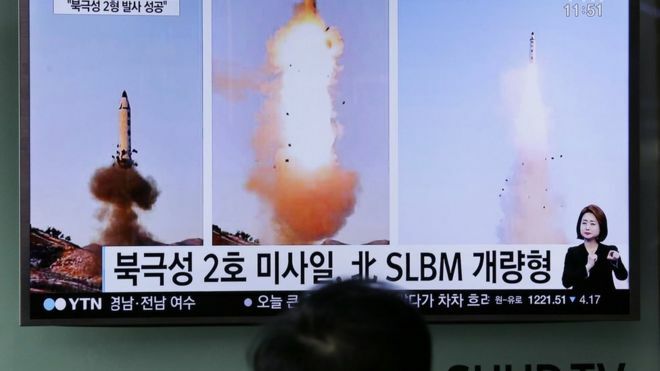 It said the missile used a solid-fuel engine, which gives ballistic missiles greater range and means they can be readied for launch faster than liquid-fuel missiles. It was a new version of a missile test-fired from a submarine in August 2016 and was fired in a high arc in consideration of neighbouring countries, the report said. Kim Jong-un “expressed great satisfaction” over the test launch, which added “to the tremendous might of the country”, the state news agency said. North Korea said that the missile could be tipped with a nuclear warhead. 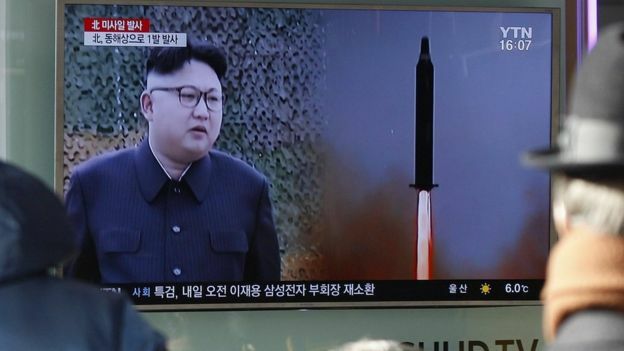 Most analysts believe it is unlikely that Pyongyang has mastered the technology to make a miniaturised warhead that could be put on a missile – but they believe it is capable of reaching that goal in the future. 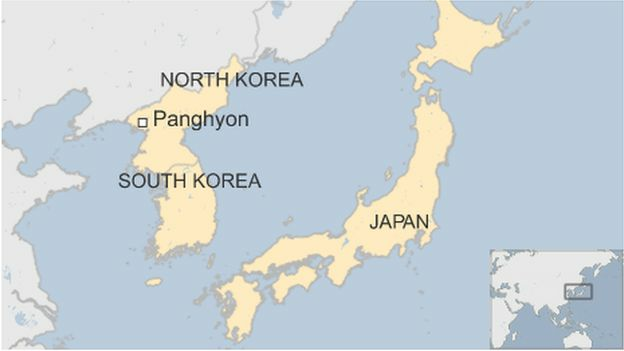 South Korea’s defence ministry said the missile, launched from the Panghyon air base on North Korea’s west coast early on Sunday, flew east about 500 km (310 miles) before falling into the sea. Experts suggest the tests are programmed for shorter distances to avoid a missile landing on Japan. Officials in Seoul said the rocket had been launched by a “cold-eject” system, which uses compressed gas for its initial thrust, a system employed for submarine-launched missiles. This was the latest in a series of tests in the past year, including North Korea’s fifth test of a nuclear device in September 2016. United Nations resolutions forbid North Korea from carrying out ballistic missile tests – part of wider efforts to prevent it becoming a fully nuclear-armed power. Nato also condemned the missile test, with Secretary General Jens Stoltenberg urging North Korea “not to raise tensions further and to re-engage in a credible and meaningful dialogue with the international community”. The European Union joined the criticism, declaring in a statement that North Korea’s “repeated disregard of its international obligations is provocative and unacceptable”. In January, Kim Jong-un warned that his military was close to testing long-range missiles capable of delivering nuclear warheads to the United States mainland.